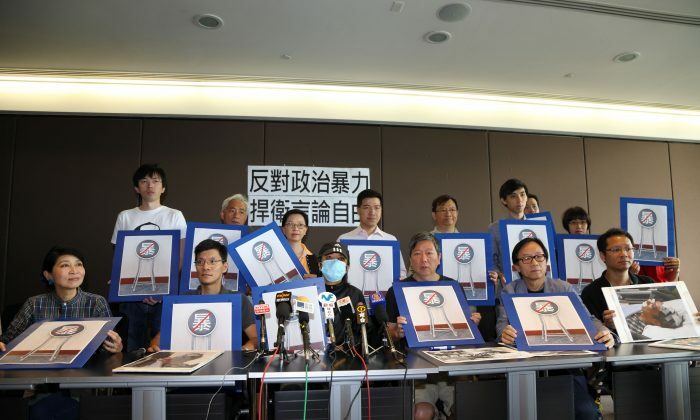 HONG KONG—Representatives of eleven pro-democracy groups held a press conference on June 12 to warn that freedom of speech and the rule of law are endangered in Hong Kong. Their concerns were triggered by the beating of a Hong Kong resident by individuals believed to be members of a Chinese Communist Party front organization. Mr. Chan, the victim of the attack, spoke at the press conference, explaining what had happened. Around 6 p.m. on June 6 he was walking through the busy district of Mong Kok on his way to attend a vigil for Li Wangyang, a member of the Tiananmen student movement who was imprisoned in China for 21 years and then, one year after his release, died on June 6, 2012 under suspicious circumstances. Mr. Chan passed a Falun Gong information site—a place where members of the spiritual practice Falun Gong display posters and distribute fliers that tell what Falun Gong is and why it is persecuted in China, and he saw three or four men holding a very long banner that covered the entire Falun Gong booth. A Falun Gong practitioner stood at the booth, partially obscured by the banner. Mr. Chan could not stand what he was seeing. He walked over, pressed the banner down, and asked the men why they prevented him from taking Falun Gong materials. The men, who were Hong Kong Youth Care Association members, cursed him, and one of them hit Mr. Chan hard knocking him to the table. “They were very aggressive and intimidating. One of them, whom I assume was their leader because he was not wearing the uniform, provoked me with foul language to fight with them. He kept saying, ‘Hit me, hit me,’” said Chan. The Falun Gong practitioner advised Mr. Chan to leave, but he was determined to stay. Approximately 10 Association members then dragged and pulled at Mr. Chan, again prompting the Falun Gong practitioner to advise him to leave. Mr. Chan did leave, but he went back at about 6:40 p.m. and joined other residents who were scolding the Association members. Eventually, police came and separated the two groups. “Some residents turned to scold the police, saying they are traitors spoiling Hong Kong and ruining Hong Kong,” Mr. Chan said. Since the Association members were leaving and the vigil had not yet started, Mr. Chan decided to go shopping. He had not gotten very far down the street when he was suddenly hit on the head. “Walking down the street only 10 or 20 steps, I was suddenly hit hard on my head. My first reaction was to turn around and find out what was happening. I saw a Chinese man in a white T-shirt and military haircut attacking me with a folding stool. “I saw another man holding a folding stool, and two to three other men holding something else in their hands attacking me simultaneously without speaking a word. They were targeting my head,” Chan said. He kept stepping back trying to protect himself, but he tripped and knocked open a restaurant door. Mr. Chan said he was still alert enough to pick up a folding stool and protect himself. Despite his quick thinking, Mr. Chan was hospitalized for several days due to the attack, and his head required numerous stitches. Mr. Chan assumes his attackers were Association members, and he believes this organization acts as if it is above the law. During the press conference, Mr. Chan showed his injuries and said he was worried about the Association retaliating and hurting his family. The Hong Kong Youth Care Association began harassing Falun Gong practitioners, sometimes violently, in June 2012, in an apparent effort to make Falun Gong information sites inaccessible to the public. In August 2012 Hong Kong’s Next magazine reported that according to a worker in its office in Shenzhen, just across the border from Hong Kong in mainland China, the Association shared an office and staff with the local 610 Office—the Party agency charged with conducting the persecution of Falun Gong. The magazine also reported the head of the Association was a Party official in mainland China. At the press conference, Li Zhuoren, president of the Hong Kong Alliance—described on the group’s website as “the largest grassroots pro-democracy advocacy group in Hong Kong”—and a member of the Hong Kong Legislative Council, questioned why the police have not presented investigation results after an entire week had passed. Leung Yiuchung, a member of the Hong Kong Legislative Council, believes that the basic way to solve this problem is to change the attitude of Hong Kong Chief Executive Leung Chun-ying. He asked Leung Chun-ying to publicly condemn the violent actions. If not, it will be impossible to protect the Hong Kong people’s freedom of speech, said Leung Yiuchung. Shi Zangshan, a Washington D.C.-based expert on Chinese politics, told an Epoch Times reporter that it’s actually very easy for the police to clear up such a criminal case, but the Hong Kong police deliberately deferred it. Shi said the only possible explanation is that the attackers are associated with a “government background,” meaning that they are linked to those in power. He added that no one is isolated in this world. If any person is subjected to unfair oppression, sooner or later, it will be extended to all people. The existence of Falun Gong in Hong Kong relates to whether or not free institutions can exist in Hong Kong, Shi said. It also proves that Hong Kong has been impossible to isolate from the politics of mainland China. Translated by Joseph Wu and Yu Chen. Written in English by Arleen Richards.